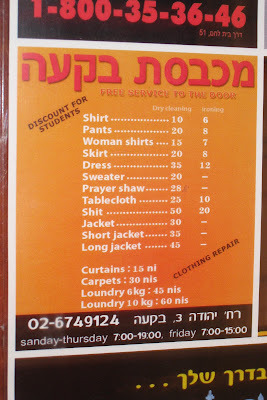 I thought it was supposed to say "shirt" and couldn't figure out why that would cost 50 NIS to wash, and then realized that it's supposed to be "sheet." So it's not an "r" missing as much as that pesky old English language, where "i" is sometimes pronounced "ee" (as in "machine," or, uh, "brit milah"). Also, in linguistics, I think "i" by itself sounds like "ee" as in "sheet." It's nice how their ad matches my color scheme, though, isn't it?